Do you struggle to play your best golf in competitions? Perhaps it was your mind that got in the way and caused that poor swing or poor performance. 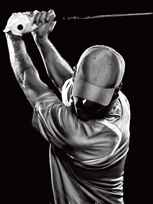 Do you always look to your swing mechanics for the answers? It is like losing your keys in the basement and looking for them upstairs because the light is better. 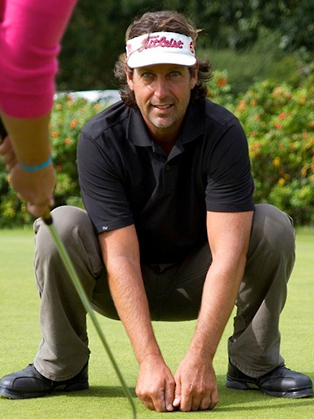 Jon Adler delivers the only practical Mental Game Coaching in the UK. On the practice ground, the putting green and the golf course you will learn from your own experience how to understand why you get so frustrated when you play, discover how you get in your own way, understand how anxiety affects your game, how to concentrate under pressure, learn how to practice effectively and take it to the course, develop trust and confidence, how to develop confidence on the putting green and over chip shots , and how to play your best golf when it matters. Jon began working as a Executive Performance Coach in 2001 and took up golf as a hobby soon afterwards. It was his inconsistency in golf that led to Jon moving away from the Positive Thinking approach favored by virtually all of the Golf Psychologists in this field and he founded Golf is a Mind Game, a Performance Coaching Company in Bournemouth U.K. Developing an approach based on Mindfulness, Jon discovered a way of Performing and Coaching that has proved to be as popular with Touring Professionals as it is with Amateur golfers. Encouraging golfers to develop their ability to master the skill of Relaxed Concentration, this very practical style of Mental Coaching has to be experienced to be fully understood. 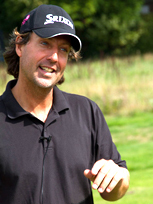 Jon has worked with golfers on The European Tour, The Challenge Tour and The Seniors Tour as well as countless amateurs. They all shared a similar goal, to play their best golf when it matters. Jon continues to play golf and uses his coaching techniques in his own game. In 2009 He won the Bournemouth Open, the only 72 Hole Amateur Handicapped Competition in the UK – and then defended it in 2010 – a feat that has never been witnessed before in the competitions 59 year history. I have always felt confident with my game tee to green but my putting has always been the weaker part of my game. This effected my confidence, but working with Jon over the past year we have managed to find a key thought which has helped bring my confidence with my putting up and in line with the rest of my game. I now feel I can hole more putts. This has been a great help over the last year, 2012, as I have won 6 mini tour events. Lee James British Amatuer Champion, 6 Times Challenge Tour Winner, Winner Jamega Tour Order Merit. I worked with Jon during the 2006 and 2007 season, the work we did during that time without any argument helped me so much, resulting in me regaining my European Tour card via the Challenge Tour. The mental work we did was so beneficial, it turned my putting around, and therefore my self belief came back to me through Jon's tireless hours working with me at his home and at tournaments.